Located thirteen kilometers north-east Paris, Paris Bourget Airport - this first Parisian airport has been, since 1981, devoted to business aviation. Paris Le Bourget airport is open 24/24 everyday, and welcomes all types of planes from private jets to commercial aircrafts and helicopters. 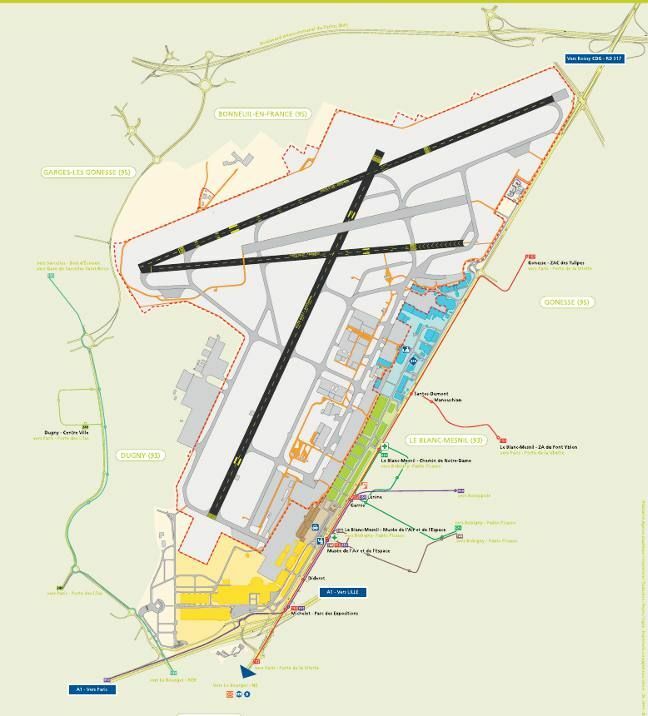 Covering 553 hectares, Le Bourget airport operates with three runways in different lengths (3 200 m, 2 600m et 1 800m). The airport handles about 130 000 passengers per year and ranks as one of the first in the field of business aviation. Night-time flight restrictions are imposed for : jets and aircrafts over 5.7 tons between 10.15 p.m. and 6.a.m. The private Bourget airport is one of the few to have several FBO (private terminals) to meet the demands of customers – well-known people, public affairs, families…- with areas devoted to VIPs, lounge, different services: conference room, concierge, private parking, relaxation areas and games… You will also find hangar-based-business aviation authorized maintenance service centers such as PART145. Companies providing specialist maintenance services are Airbus Helicopters, Cessna, Daher Socata, Dassault, Embraer and also Aérodesign, Aérostock, Aertec, Mauras, Satori… not to mention a dozen business aviation companies. In the vicinity of the airport, several trade fairs and renowned international events are organized. Paris- Le Bourget exhibition center hosts the bi-annual the International air and space show "Salon International de l'Aéronautique et de l'Espace" The exhibition center also hosts more than thirty professional or non-professional events each year- Salon Texworld, Tradexpo, Foire Musulmane, VDL, Salon du X… The Air and Space museum organizes exhibitions and conferences – (carrefour de l'air, salon des métiers de l'aéronautique, etc…) -. The museum is also the guardian of an exceptional collection covering all themes on air and space. Check in the list for hotels to Bourget Airport, restaurants, as well as information about the different methods of transport in North-East - Paris. Plenty of choice available to get to and from Paris le Bourget exhibition center. car: from the airport CDG to Le Bourget, take A1 motorway and then route national 2. Parking is available. 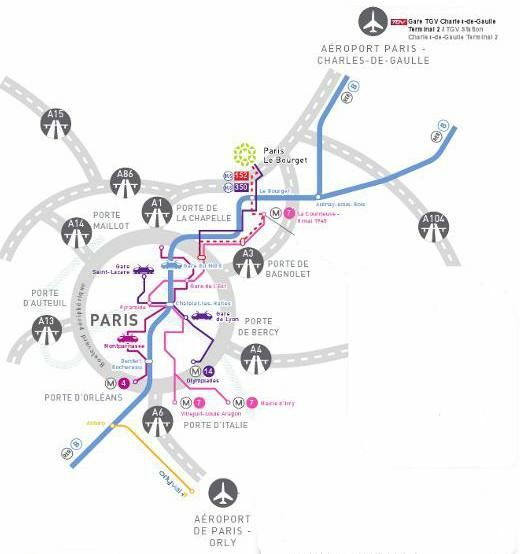 public transport network: For Bourget airport located in Air and Space museum and parc des expositions du Bourget, take the Parisian public rail transport network via RER B to the Le Bourget station and then take bus 152. The 152 bus stop is opposite Cité des Sciences at Paris-Porte de la Villette station right beside metro line 7. 350 bus : leaves from Gare de l'Est in Paris – get off at the stop "Musée de l'air et de l'espace". 148 bus : the 148 bus leaves Bobigny at the Paris Metro station - line 5 - and the bus station "Pablo-Picasso". Metro line 5 and bus station are close to the Prefecture and Seine-Saint-Denis County Council. taxis : Taxis are available on call -01 48 62 52 33 on the esplanade of the air and space museum.